Alf and Lily Creations had a giveaway celebrating her graduation. I was notified I won! How exciting. The win is for a Internet company gift card. I need some help........where do I get a gift card from??????? I always just love looking at all the quilts that can be found on the Quilt Festival site. It has been awhile since I participated. I had participated in a batik swap at the local guild. The larger squares are from that swap. The tiny squares were collected from a trip back in 2008 we took with my mom and step dad. This Alaskan trip took us by bus, train and boat. It was the time frame when the weight restrictions were just starting on luggage. I brought back several fat quarters from different spots in Alaska, fabric can be heavy. 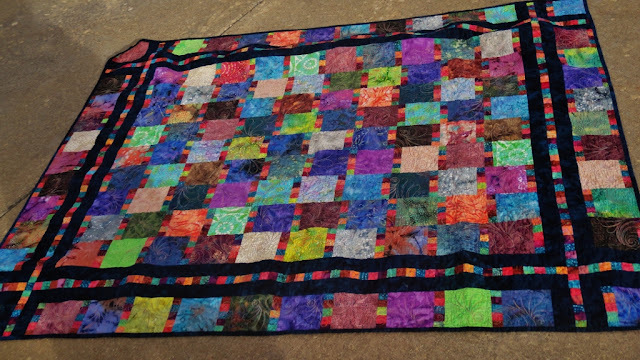 The dark border is really what makes this quilt sparkle for me. The quilt was inspired from the Fiesta quilt that is on the Apq.com website. I didn't have measurements so this is my interpretation not the actual pattern. Someday, I may make their version. I used a Sharon Shamber hooped design to quilt it, then meandered between the patterns. Stop over and check out the other quilts at Blogger's Quilt Festival-Fall 2012. Happy Quilting. Get up and sew.......give it 10 minutes. Ten minutes CAN change your life. I can’t believe we are already at the end of October. We were graced with a visit from my mom and step-dad this weekend. They left this morning to go back to Michigan. I managed to get the quilting and binding done on my Floral quilt. This was a 2011 UFO that didn’t get finished. It always feels so good to finish something. The blues, yellows and reds in this are so vibrant. The Christmas Traditions quilt is just about done. The last border needs the quilting. The thread for this last border was donated on Sunday. Here is an older picture. We are hand quilting it with the perle cotton thread and a larger quilt stitch, commonly called “Big Stitch” in this area. We used black thread for the small sashing and red thread on the light beige border. Here are the items on the design wall. 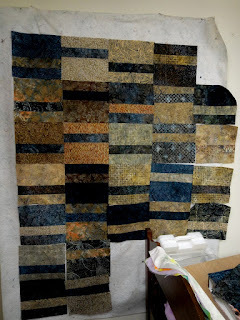 This layer cake is destined to be the “The Brown Quilt” by Judy L. Stop by and see the other Design Walls at "The Patchwork Times” also by Judy L.